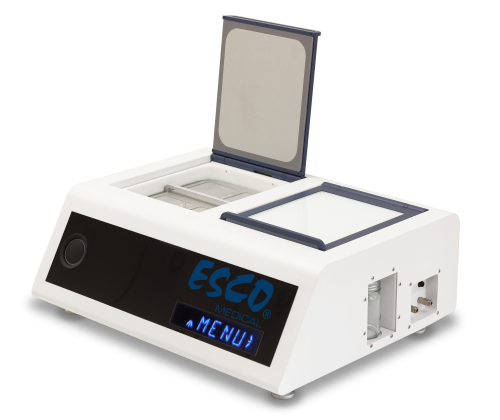 DESCRIPTION: The Mini MIRI® Benchtop Incubator is a humidified incubator based on the trusted MIRI® chamber design that ensures a stable culture environment. Two independent MIRI® chambers, with precise temperature and gas regulation: Opening a chamber does not affect the environment in the other chamber. Easy access to water bottle for refilling and maintaining water level. Heated chamber lids prevent condensation, enhance temperature regulation/recovery, and ensure temperature uniformity between the top and bottom of the chamber. Works with premix gas or 100% CO2 gas, with NDIR CO2 sensor to regulate CO2 levels. Large easy to read LED display and easy to navigate menu. Continually monitors and documents gas flow, gas concentration and pressure, temperature and humidity regulation. Audible alarms for out of range parameters, with alarm logs documented in the Data Logger. Optional SAFE Sen integration for continuous pH monitoring without opening the chamber.